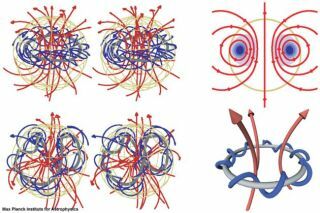 In a simulation, magnetic field lines in some stars form a ring of lines twisted around each other (blue). Field lines protruding through the surface (red) are held together and stabilized by the twisted ring inside. This is illustrated by the schematic sketch (the lower right) and the cut through the star (upper right). The field drifts slowly outward over hundreds of millions of years, then distorts into the shape of the seam on a tennis ball (lower left), after which it disappears from the star. While you may never have pondered the similarity between a common bar magnet and a star, astronomers do, and they believe they have figure out why the two disparate bodies are sometimes strikingly similar. Magnetic activity on many stars, such as our Sun, varies a lot over days, weeks and years. Magnetic fields pop in and out of existence at different spots and overall intensity changes with time. But other stars have strong, consistent magnetic fields that behave just like the smooth and static field of a bar magnet. Astronomers call them magnetic stars. In these magnetic stars, as with bar magnets, magnetic field lines emanate from each pole, north and south, and loop outward like the skeletal lines of a perfect pumpkin, connecting one pole to the other. Magnetic A-stars are otherwise normal and about two to 10 times as hefty as the Sun. One example is Alioth, the third star in on the handle of the Big Dipper. Some white dwarfs, which are burnt-out stellar corpses, have magnetic fields 100,000 times stronger than the typical magnetic A-star. Magnetars are ultra-dense neutron stars that have fields 100 billion times stronger than a commercial bar magnet.